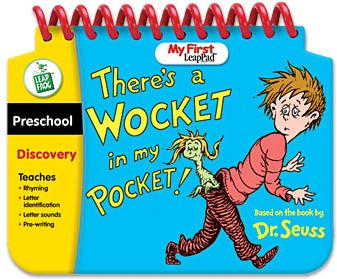 My First LeapPad Book - Dr. Seuss - Wocket in Pocket - $12.99 Suggested Retail! Size (inches): 8.46" X 9.25" X 0.79"
Dr. Seuss has delighted children for decades with his imaginative illustrations and his fanciful rhymes. Based on the popular Dr. Seuss book, this interactive version of "There's a Wocket in my Pocket" is packed with games and fun to help your child learn letters and letter sounds, beginning phonics, the early skills needed for writing, and much more! For use with the My First LeapPad Learning System (sold separately). More Photographs - My First LeapPad Book - Dr. Seuss - Wocket in Pocket - $12.99 Suggested Retail! End of More Photographs - My First LeapPad Book - Dr. Seuss - Wocket in Pocket - $12.99 Suggested Retail!